Yonkers Raceway, founded in 1899 as the Empire City Race Track, is a one-half-mile standardbred harness racing dirt track and New York state-approved video-lottery terminal (VLT) racino located at the intersection of Central Park Avenue and Yonkers Avenue (between Exits 1 and 2 of the New York State Thruway) in Yonkers, New York near the New York City border. It is currently owned by the Rooney Family, the five sons of Art Rooney, the Pittsburgh Steelers football legend. Yonkers Raceway, considered a city landmark, was first opened in 1899 by William H. Clark's Empire City Trotting Club. Clark died in 1900 and, with much litigation by his heirs over its proposed sale, the track remained closed for most of the next seven years except for special events. One such event occurred in 1902 when Barney Oldfield set a one-mile (1.6 km) record in an automobile at Empire City Race Track. Driving the Ford '999', he covered the distance in 55.54 seconds. The facility was purchased by New York grocery store magnate James Butler who reopened it for Thoroughbred horse racing in 1907. Among the notable thoroughbreds who raced at Empire City, in 1936 Seabiscuit won the Scarsdale Handicap at Empire City. After the death of James Butler in 1934 the track continued to host "the flats" until 1942 when it was converted back to being a harness track. In 1950, William H. Cane, for whom the Cane Pace is named, headed a syndicate formed as the Algam Corporation which acquired Empire City and converted it to Yonkers Raceway. Its popularity having greatly declined since the 1960s (when crowds would occasionally reach 50,000), the entire property, according to some, had become an eyesore due to its owners leaving it in a state of disrepair. Yonkers Raceway underwent some cosmetic changes in the late 1990s. It was used as a flea market, and hosted the annual Westchester County Fair, sponsored by the county's Park Department. In 1996, the finish line was relocated to the end of the stretch, increasing the length of the stretch from 440 feet (130 m) to the current 660 feet (200 m). The following year, the Raceway grandstand was demolished. There was consideration on selling the site to the National Football League Jets that would have included a stadium; however, the plan was shelved after the environmental impact statement showed there would be significant traffic from elsewhere in the metropolitan area, and there was not enough political support for it. Yonkers Raceway had a US$225 million renovation to put in more than 7,500 high-tech slot machines. The first phase opened on October 11, 2006, with 1,870 video gaming machines installed. Despite a "soft opening", with no major advertising or promotional campaigns, Yonkers netted $3.8 million in revenue in its first week, outpacing its nearest competitor, Saratoga Gaming and Raceway, by two-thirds. The second phase of the project, which opened on December 28, 2006, added 120,000 square feet (11,000 m2) of space to bring the total number of VLT machines to 4,000. On March 12, 2007, the third phase opened to bring the VLT machine total to 5,300. Because the facility falls under state lottery laws, the minimum age to play the VLT games at Empire City is 18, unlike the other area casinos, where it is 21. Yonkers Raceway could not immediately restart harness racing due to 64 fire code violations charged on the portions of the facility that were closed or under construction. The New York State Racing and Wagering Board required that the violations be cleared before both racing and simulcasting could resume. On November 10, 2006, the state board, confident that all outstanding safety issues would be addressed, issued Yonkers a racing license, and racing officially resumed on November 17. 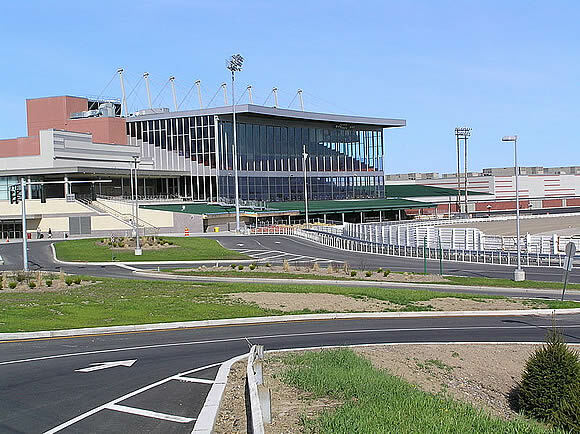 It is estimated that Yonkers Raceway will eventually attract an average of 30,000 visitors a day, compared to only 700 visitors a day when racing was suspended in June 2005. Yonkers previously was the site of the Cane Pace, one of the legs of the Triple Crown of Harness Racing for Pacers. It is now the host track for another leg, the Messenger Stakes. Yonkers is also home to the Yonkers Trot, one of the legs of the Triple Crown of Harness Racing for Trotters. Due to the renovations at Yonkers, the Messenger and Yonkers Trot were moved to different racetracks for the 2004 and 2005 editions. The Messenger was moved to Harrington Raceway in Delaware in both years, and the Yonkers Trot was moved to Hawthorne Racecourse in Stickney, IL in 2004, and Freehold Raceway in New Jersey in 2005. Yonkers Raceway ran both the Yonkers Trot and the Messenger on November 25, 2006, becoming the first harness track in America to host two Triple Crown races on the same day. Glidemaster, by virtue of winning the $728,000 Yonkers Trot, became the eighth horse to clinch the Trotting Triple Crown; the trotter would go on to be named 2006 Harness Horse of the Year. Yonkers Raceway is also home to the Art Rooney Pace for three year olds. However, continued delays in the reopening of the track forced the 2006 edition of the race to be moved to Monticello Raceway. The final of the 2007 Art Rooney Pace, run on June 2, 2007, was the richest race in Yonkers history, with a $1 million purse. It was won by Southwind Lynx with a late outside run in 1:52.3. Tim Tetrick was the driver. The current track record for a trotting race horse is 1:54 and 3 fifths of a second set by Shutter Boy on October 30, 2009, with the trainer John McDermott and driver Yannick Gingras(this was not a stakes race).